Learn about the amazing feat of the Butterfield Overland Mail Stage. The stage operations, which began in 1858 between St. Louis and San Francisco, revolutionized mail and passenger service. Traveling 24 hours a day, the 2,800-mile trip took an unheard-of 25 days! The stage line forever changed travel and mail transportation. 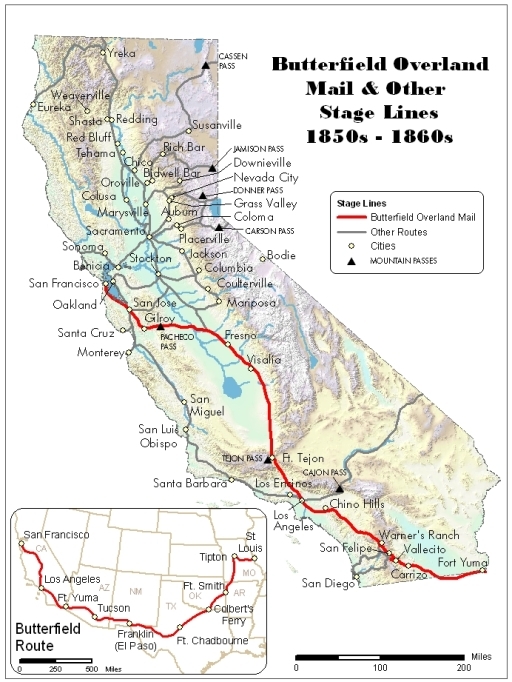 San Antonio and San Diego Mail Line, made its 1475-mile journey between those two points in 52 days. More than a thousand miles longer, the Overland Mail Stage cut that time by more than a half. Find out how operating a stage line was a risky business, as well as a moving experience for passengers. Every station stop was an adventure and there were always stage road hazards to overcome. Read Mark Twain's observations on the stage company hierarchy and revisit some of California's most famous Jehus or stage drivers. These whips drove more than the classic Concord stagecoaches seen in the movies. 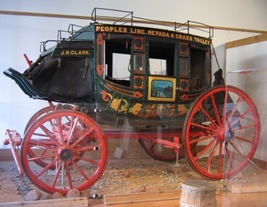 The first stagecoach started out from San Francisco on September 14, 1858, at ten minutes after midnight. 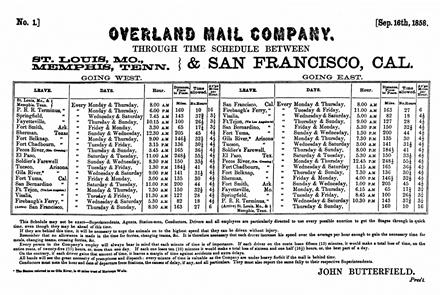 This was John Butterfield's time schedule that set the goal for the time of arrival at each "timetable" station. The average distance between them was about 160 miles. The driver on the eastbound stage would meet the driver of the westbound stage at a timetable station and they would exchange mail and passengers and turn back. This way each driver and conductor became intimately familiar with his section of trail. As the stages traveled twenty-four hours a day without stopping for sleep, a single driver who drove a stage the entire 2,700 mile distance in twenty-five days would have to stay awake for the entire time--an impossible task. No more than twenty minutes were allowed to stop at a station. There were 100 stage wagons distributed to the various stations and no single stage completed the entire journey. In 2008, festivals and programs were held as part of our Stagecoach Days: 150th Anniversary, recognizing and celebrating the history of the stagecoach. Events featured living history days, tours, lectures, stories, songs and stage equipment displays. View Stagecoach Days 2008 Event Information.